British Prime Minister Theresa May speaks next to her husband Philip in London Friday. May's gamble in calling an early election backfired, as her Conservative Party lost its majority in Parliament. Democratic Unionist Party leader Arlene Foster speaks at a press conference in Belfast, Northern Ireland, on Friday. Prime Minister Theresa May says she's forming an alliance with the Democratic Unionist Party to stay in power. "What the country needs more than ever is certainty," she said. 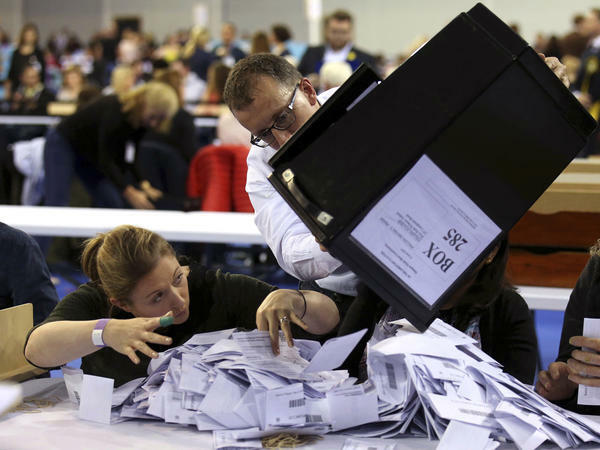 Now, though, the political landscape of the United Kingdom and the country's path toward leaving the European Union seem more unclear than ever. Front and center among many questions facing May's new government is the matter of Brexit. Negotiations with the EU are scheduled to begin later this month. 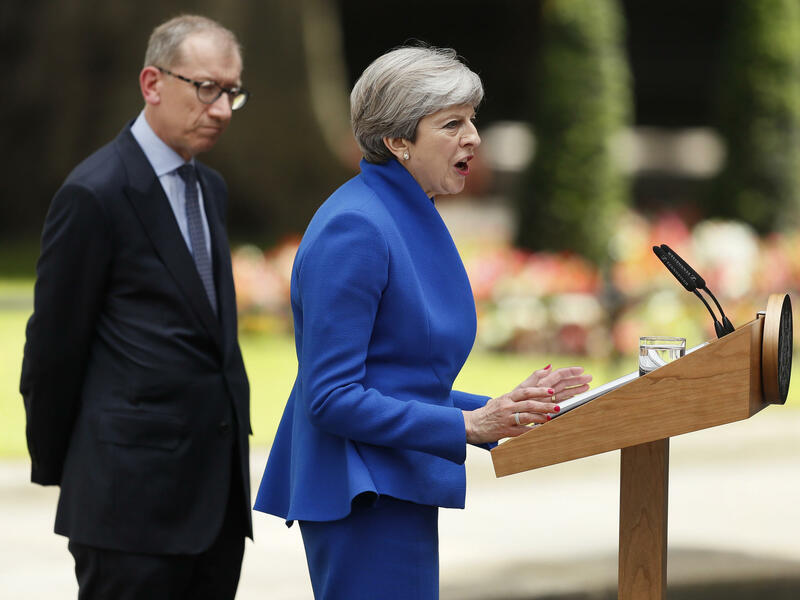 "The irony of this is that Theresa May is calling this a certainty government and talking about how it's delivering certainty," said Brian Klaas, a fellow in comparative politics at the London School of Economics. "I think the only thing that political commentators can agree on is that we have uncertainty right now and nobody has any clue what shape this negotiation is going to take." May has been pressing for a so-called "hard" Brexit, which would include leaving the EU's massive collective market and no longer allowing EU citizens to come and live and work freely in the United Kingdom. Some members of Parliament in May's Tory party and the rival Labour Party favor a softer Brexit, in which the U.K. might maintain a much closer relationship with the EU. Analysts say May's electoral debacle could reopen what had seemed largely a closed debate — both with pro-EU members of Parliament trying to take advantage of the prime minister's weakness and Euro-skeptic government ministers threatening her if she dares water down a Brexit deal. "Everybody is positioning themselves," said Anand Menon, professor of European politics and foreign affairs at Kings College London. "Remember, both parties are divided." It's hard to predict how they'll react, he says. "I think the Conservative party as a whole is reluctant to get rid of Theresa May now because it would mean a leadership election, it would mean stalling on Brexit talks," Menon said. "But at the same time, she's very, very weak. So whether they can hold a weak leader in place — tactically, as it were — until they are ready to move, I don't know." "We don't know when Brexit talks start," Tusk tweeted. But "we know when they must end. Do your best to avoid a 'no deal' as result of 'no negotiations.'" Given May's diminished state, many in the European Union are wondering how long she will be leading the country and – by extension – guiding the Brexit negotiations. "How do you negotiate when you know that the position of the partner that you're negotiating with is extremely weak?" says Klaas of the London School of Economics. Some in Brussels may see this as an opportunity to drive a hard deal and dictate terms, Klass believes, while others may worry a weak prime minister won't be able to get parliamentary approval for a tough deal. If all this uncertainty weren't enough, the Labour Party, which won 261 seats in the election, has its own divisions to deal with. 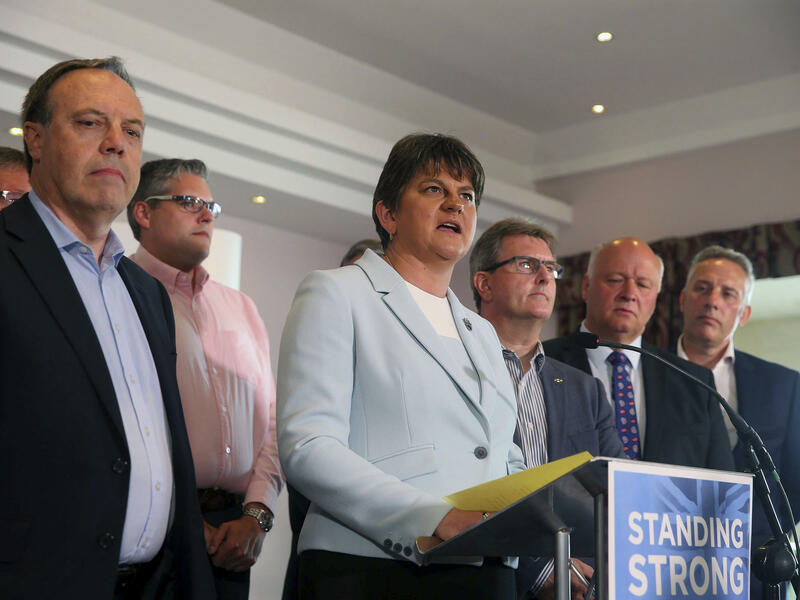 And the relationship between the Conservatives and its minority government partner, the Democratic Unionist Party, also remains unclear. At a press conference today, DUP leader Arlene Foster was vague about a working relationship with May's Conservatives. "The prime minister has spoken with me this morning," Foster said. "We will enter discussions with the Conservatives to explore how it may be possible to bring stability to our nation at this time of great challenge."